Do I need a valid UK car driving license in order to operate a forklift in the workplace? No, driving a car and operating mobile plant are very different tasks, although they use some of the same skills. There is no legal requirement. It is over three years since I did my basic lift truck training. My employer has refused to send me on refresher training. Is he obliged to provide additional training? 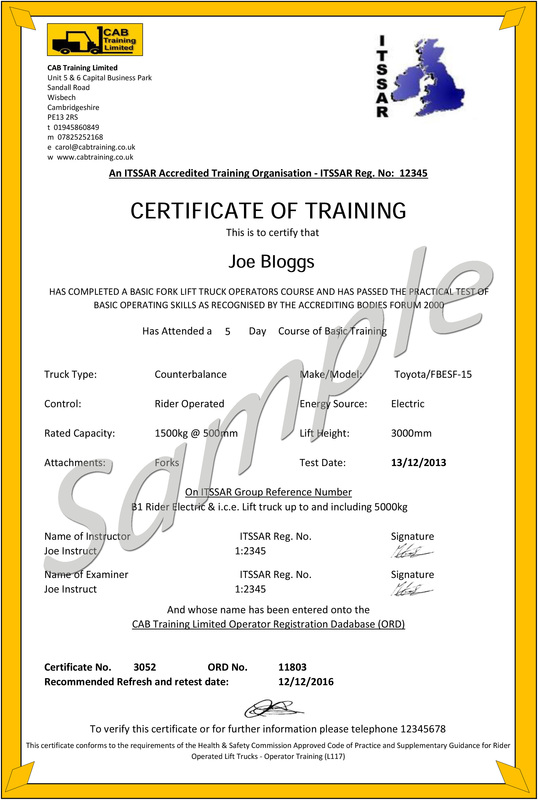 There is no specific requirement to provide refresher training at set intervals, but even trained and experienced lift truck operators need to be re-assessed from time to time to ensure that they continue to operate lift trucks safely. CAB Training recommend Refresher Training every 3 years. I've never received any formal training to drive a lift truck. What are the legal requirements? Your employer has a general duty under section 2 of the Health and Safety at Work etc Act 1974 to provide information, instruction, training and supervision to ensure the health and safety of their employees. What is the minimum age at which people can operate Forklift Trucks? Potential Operators should be the minimum school leaving age of 16 (except in docks where they must be at least 18 years old). I am worried about my reading and writing, will it be possible for me to do a forklift course? Yes, CAB Training are here to help everyone, as a Equal Opportunities Company we will do our very best to help everyone! What's the difference between an IN-House (not accredited) certificate and Accredited certificate? 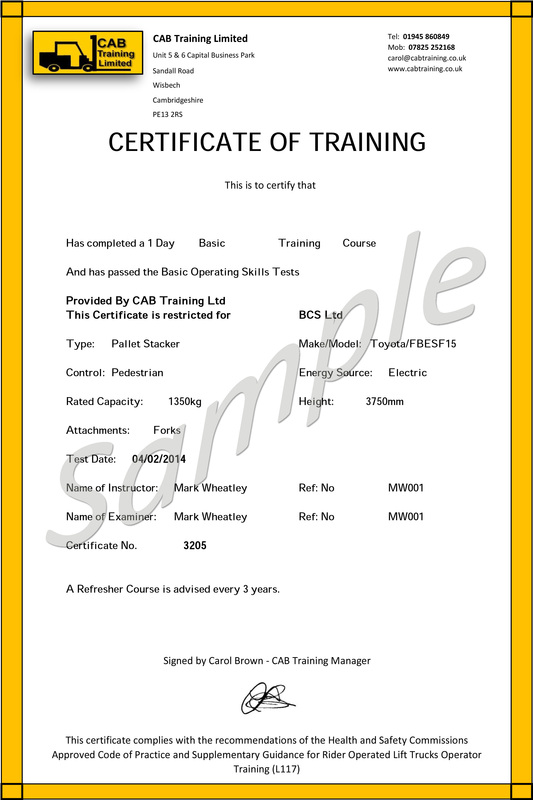 The certificate issued has no reference to any governing body and is not a certificate of accredited training, and possibly restricted for company premises only. Which means it is not accepted for any other company, is not a national certificate. Certificate 1 is an example of a certificate of Accredited Training; the HSE recognized Governing Body in this instance is ITSSAR. The certificate clearly displays the Organization accreditation Number and has been enforced by the Accrediting Bodies Forum 2000, recognized by the HSE. The Instructors ITSSAR Reg number is clearly marked on the certificate as well as ITSSAR Logo. Certificate number 2 is an example of what an "IN-House" certificate could look like, there is no reference to any HSE recognized governing body, the certificate is not endorsed by any governing body, there are no logos displaced of governing bodies. The certificate is restricted for TTT Ltd only. The Instructors registration number has been replaced with a reference number. This certificate is not recognized nationally. See how many differences you can find..... If you would like any further information on this subject, do not hesitate in contacting me. REMEMBER A LIST OF THE GOVERNING BODIES RECOGNISED BY THE HSE CAN BE FOUND IN THE PREVIOUS EDITION OF HSG6 THIS INFORMATION IS NOT IN THE NEW L117 HSG6 COMBINED, HOWEVER I HAVE VARIFIED THIS INFORMATION IS STILL CORRECT WITH HSE.